Avocado Egg Salad is the BEST egg salad recipe, you will love the avocado addition. 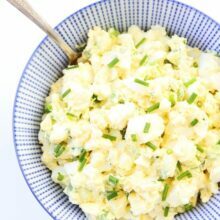 Use your hard boiled eggs to make this delicious egg salad recipe! Have you dyed your Easter eggs yet? We are going to attempt to do a few with the boys. It might be one giant mess, but we will try to keep things under control. Josh loves dying eggs! I know we are going to be stuck with lots of leftover hard boiled Easter eggs because when Josh dyes eggs, he goes all out. I am ok with having leftover hard boiled eggs because that means I get to make the BEST egg salad recipe, Avocado Egg Salad. Adding creamy avocado changes everything. Avocados really do make everything better! You can use your leftover hard boiled eggs to make an easy, delicious, and healthy egg salad. 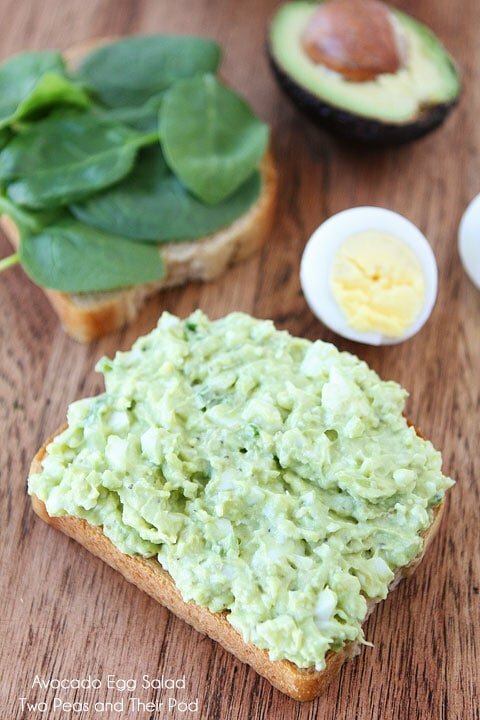 You can eat this avocado egg salad for breakfast, lunch, dinner, or for a snack! Kids and adults love this easy egg salad! To make egg salad, you do need hard boiled eggs. We love making our eggs in our Instant Pot. They turn out perfect EVERY time. If you don’t have an Instant Pot, you can hard boil the eggs on the stove. 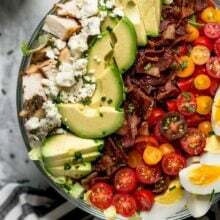 Once you have your hard boiled eggs, you can whip up this easy Avocado Egg Salad in a matter of minutes. I use two hard boiled eggs and two hard boiled egg whites. I like using a mix to keep the egg salad on the lighter side. If you want to use all hard boiled eggs, you can do that too. Make sure you use a ripe avocado so it will mash right into the egg salad. The avocado is a game changer and makes the egg salad EXTRA creamy! Instead of using mayonnaise, I use plain Greek yogurt to make this healthy egg salad recipe. I promise you won’t miss the mayo. This egg salad without mayo is my favorite. I love the extra boost of protein the Greek yogurt adds. For extra flavor, I also add in green onion, fresh lemon juice, and Dijon mustard. I like to spread the Avocado Egg Salad on to two slices of whole wheat bread. I add fresh spinach leaves and voila-perfect sandwich! Is it lunch time yet? Because I am kind of craving an Avocado Egg Salad Sandwich now. Mmmm! Who knew hard boiled eggs could turn into something so tasty? Avocados for the win! You can also serve Avocado Egg Salad with crackers, cut up veggies, eat it in a wrap, or add it to a bed of greens! It’s also great on toast in the morning. Protein, healthy fats-the breakfast of champions! Make sure you save some hard boiled Easter eggs to make Avocado Egg Salad. It’s Egg-o-licious! Avocados take this egg salad to a whole new level! You will love this healthier version of the traditional egg salad! 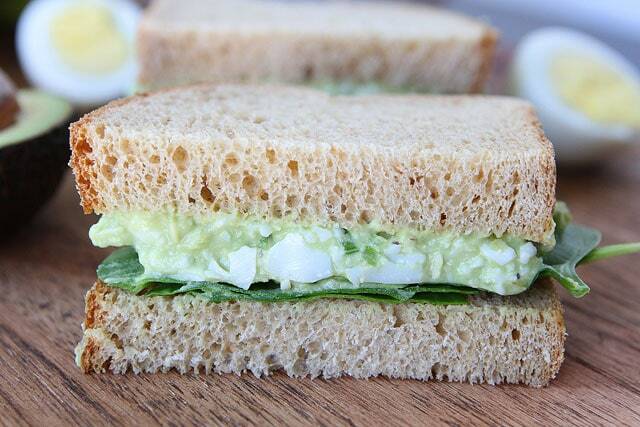 Serving suggestions: Spread between two slices of bread for an Avocado Egg Salad Sandwich. Eat with crackers, cut up veggies, on toast, or in a wrap. This salad is best eaten the day it's made. yayy for egg salad sans mayo (ick!). I don’t know if we’re going to do eggs or not…we should probably figure that out! Yum! These look delicious! Can’t wait to try them with all of our left-over eggs too! Ohhh your egg salad sandwich looks delish!! Love the egg and avocado combo. Love everything about this… and it makes me wonder why I never thought to mix avocado with my egg salad. Brilliant! I have been want to make an avocado egg salad for a while now!! I am so excited to try yours!! Avocado’s + Eggs are amazing! My husband will go crazy for this! Love! I’m dying over this – avocado egg salad just sounds simply magnificent!! I want to dig in right now!! This is so perfect for leftover eggs (which we will DEFINITELY have). Can’t wait to try!! Avocado and eggs?! Yes please! Perfect sammy!! 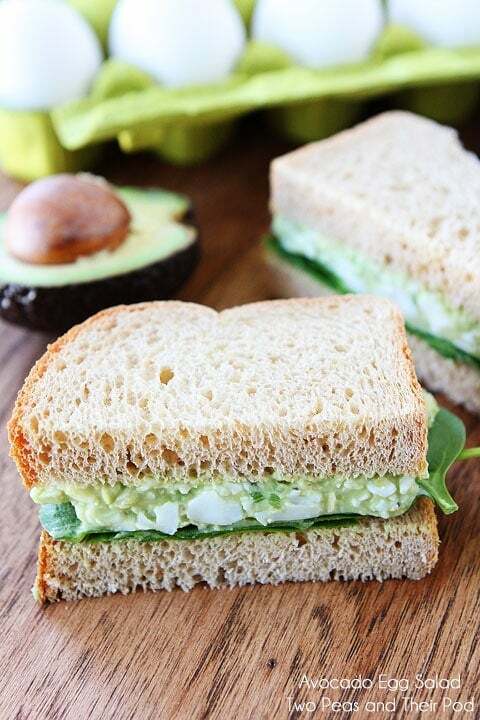 Avocado and egg is a fabulous combo and that sandwich is looking really good! I have got to try the greek yogurt instead of mayo thing. This sandwich looks delicious! 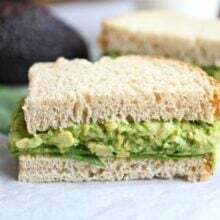 I love egg salad sandwich, this version sounds great because it adds one of my favorite foods avocados! Another avocado classic. Your going to give Gaby a run for her avocado queen tiara. Looks so yummy! I haven’t made a good egg salad in years (totally my own fault) but I know this would be stellar. Great recipe! Oh yes this sounds wonderful!! I love hard boiled eggs AND avocado! So this is a match made in heaven for me! ok, the part where you said no mayo sold me! I am always skiddish of egg salad for that reason, but you made it less scary for me with the yogurt and the delish creamy avocado! I’m with you…avocado does make everything better! Love this! Such a great egg salad, love it! And definitely get Caleb in on coloring eggs…it’s a little precarious those first years, but they love it!! We’ll be coloring eggs at the end of the week, yay! Sounds good but my husband would not eat it. Love this! 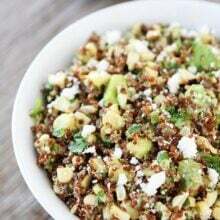 I find that adding avocado to almost anything makes it more delicious in my book 🙂 I just made a similar version with chickpeas and it was fab! I’m all for using less mayo and more of the green stuff! 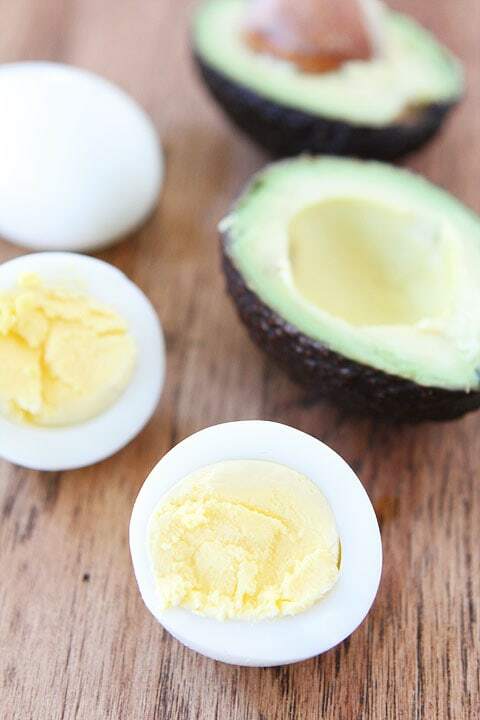 Eggs and avocado are the perfect combo! Now my brain is spinning with ideas on where else I could stick an avocado. I loved your avocado + feta dip, and this egg salad looks yummy. I usually just stick potato chips in my egg salad (it’s a great crunch). I love egg sandwiches, but never thought of adding the avocado! Brilliant… and gorgeous! I need these sandwiches! Love this combo in a deviled egg and a sandwich sounds perfect, too. I detest mayo with a fiery passion so this is the only egg salad I’m interested in! Having a “duh!” moment. Avocado DOES make everything better. Never thought of it in egg salad. I agree, avocados do make everything better, and these look SO good!! Have fun dyeing your Easter eggs! Avocado totally makes everything better and this sandwich looks delish! this sounds like something i’m going to need in my life soon… i love hard boiled eggs. avocados are divine. Together, a match made in foodie-heaven. YUM! The addition of avocado in this egg salad is pure genius! Sounds so delicious!! I love eggs and avocados! What a fabulous way to enjoy all of those Easter eggs. I am not a mayo fan so when I see it in recipes, I always use plain Greek yogurt. If you add a little ham (either a deli slice or chopped up leftover from Easter) you can make it a Green Eggs and Ham Salad sandwich! Oh yum! I have made an avocado chicken salad before, so I know this has to be good too! i made avocado egg salad on monday night with our easter eggs and we devoured it! as in, two people ate four people’s worth 🙂 so good! Everything in life is better with avocado, egg salad included. Can’t wait to try this. I just made my first Guacamole Deviled Eggs. Loved them. Now I want this egg salad! Thanks. This looks absolutely incredible. Your recipe would be amazing to serve on Easter day for lunch. Thank you for sharing! This is a great idea. I just made avocado egg salad for the first time and was pleasantly surprised at how good it is! I live for post-Easter Egg Salad – I’ve never had it with avocado though – you sold me. Like it took much convincing – I’ve got 2 dozen eggs and two avocados in my fridge as I type!! This looks incredible!!! Can’t wait to try it…love your blog!! Great recipe! Wondering if you could do a post on best ways to find recipes from blogs now that punchfork is gone. I have not used Pinterest. Wish we could have punchfork back! I never would have found you without it! SOOOO making this soon!! Perfect! Pinned! Just made this yesterday and it was delicious!!! Do you have any tips on how to keep it from turning brown? I made it in the afternoon and put it in an airtight plastic tupperware container, but by evening it had turned brown. This looks absolutely amazing! It sounds so fresh, healthy, and easy! I’m so grateful you posted this recipe! Tried this tonight and ….wow! Fantastic! The perfect light supper! Made this today! It was SO good. I don’t think I’ll make regular egg salad again. This is such a cool idea, and I love the special touch of a few baby spinach leaves to finish off a (fairly!) healthy sandwich. Yum… I think I might try this today, if I can find some ripe avocados. Just ate this. OMGSH SO GOOD. I like bigger pieces of egg so i mixed those roughly chopped after mixing and mashing everything else. Love the addition of lemon juice and green onion. How many days can you eat this as leftovers? Or do you have to eat it all in the same day? I ate it the next day for lunch and it was fine! The avocado might turn a little brown, just make sure you use lime juice! Hi there, Just wondering how many calories this is without the bread? This is my new favorite recipe.. Absolutely love it! Best avocado egg salad ever ! so addictive – thank you for sharing. Thank you for this brilliantly simple, simply brilliant recipe! I had an avocado that I needed to use soon and a couple of hard boiled eggs in the fridge, and thought, hmmmm, could I make an egg salad with these? Quick search lead me to the answer to that question: your recipe! 😀 It is deeeeee-lish! I made this the other night and had family members try it. They LOVED it!!! It was a big hit. This became a new regular item for lunch. Avocado and eggs are such a natural combo, I don’t know why I’ve never had them in sandwich form before! This looks amazing! How long would the egg salad last with the avocado? I know avocados turn brown so quickly! Is this something you should eat right away, or could you make it to have for lunch for the week? It is best the day it is made, but I have eaten leftovers the next day. This looks delish! I was wondering how long it will last in the fridge… Or do you need to eat it right away? It is best the day it is made, but I eat leftovers the next day and it is fine. The avocado browns a tad, but it still tastes great. So if you were serving it, I would make it the day of, but if you don’t care if there is a little brown, you can eat it the next day. It still tastes good! Maria ~ Do you think if you mixed everything up sans avocado it would stay good for a few days? I was thinking you could add the avocado to the portion you scoop out for the sandwich maybe? This sounds so yummy! I’m not a fan of mayo or egg yolks (Are we related??) and I’m working on a post about cooking on the cheap. Eggs fit the bill! Can’t wait to try this one. I’m going to link this on my website http://www.theeducationaltourist.com where I write about traveling with the kids and making the adventure magical. I would love a shout out from you! Just made this tonight to take for lunch tomorrow… it’s delicious! Knowing the truth about “Easter” and its pagan origins, I don’t have a fridge of boiled eggs; that’s a good thing, because I despise the whites and always throw them away when I boil eggs. I like avocados, I like egg yolks, and I like good old yellow mustard, and mayo. This sounds like a very good base for an egg salad, so I’ll put my own spins on it, and see what it’s like. This is a great variation of the traditional guacamole. Thank you! We got avocado tree in our back yard and I’m always looking for new avocado recipes. Gotta try this one! Pingback: Keep Your Cool, Here’s 20 Ways to Use All Those Easter Eggs! I only put half an avocado in with the 2 hard boiled eggs. 2 avocados seemed like way too much! This is seriously one of my favorite recipes ever! 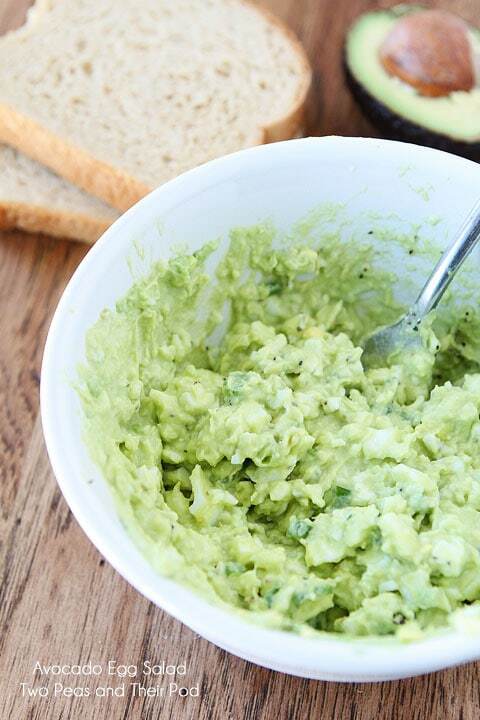 I am obsessed with all things avocado and love that this is a healthier version of egg salad. Thanks so much for sharing! This looks great! Any idea how long it will keep before turning brown from the avocado? It is best the day it is made, but if you don’t mind it browning a bit you can eat it the next day! The only things I would add to this yummy recipe are tarragon, more lemon juice and a sprinkle of my favorite garlic pepper! Normally I go with Caesar over egg salad since the crumbs tend to get caught up in my beard. But when a recipe is this good, well, who could resist!? Plus I find you can dye the shells, if you are really careful and just a tad creative. Then the only thing funner is hiding them!! 2 hard boiled eggs, 2 hard boiled egg WHITES and two avocados-about how many servings is this?? Help the disabled person , if you can ! MARAHOVSKA GANNA. Visa 4731 2171 1374 0177 Thank you for your help and your big heart ! Made this last night for dinner. It was AMAZING. This is one of my favorites recipes of yours! I can’t eat yogurt (no dairy)….would this work to simply omit it? Would it be creamy enough? I haven’t tried it without the yogurt. You might need to add more avocado. The best egg salad I’ve ever had!! A great lunch salad scooped on top of fresh spinach, yum. Definitely eat the day you make it especially if you want to serve to others. The brown color can be a little off putting! haha A great recipe! Making this right now, all the right ingredients for me to love!!!! Thanks for the inspiration! Ummmm…. this.is.amazing! My friends and family loved it. I will add a dash or two of Tabasco next time to spice it up a little, but it is fantastic as written! Is there any nutritional info on This? Cal., carbs, sugars per serving? Would really be helpful w/my app to help reach weight & health goals. This is absolutely delicious! I loved it and can’t wait to make it again. I used four eggs and mayo as I didn’t have any plain yogurt. Would definitely make again. You’d think that would not be enough green onion, but it comes right through. I made this today. Used 3 whole eggs, most of an avocado, and a touch of mayonnaise with the yogurt. No onion, but might do dill pickles next time. Probably could have put in a bit more pepper and salt, a bit more lemon. I did use honey dijon mustard, a bit more than the recipe. It is good and I will make it again. I had this with 5-grain crackers. This makes the perfect lunch! This makes a perfect breakfast to kickstart a day. Thanks so much! Wondering about making this with tuna, do you think the flavors would work? Made this for the first time and it really was delicious! I found adding a bit more lemon than in the recipe helped. Made tonight. . Used mayo as dairy in yogurt and I don’t get along. So yummy and creamy. Topped a salad with it instead of dressing! Delish! How many calories is this? It looks delicious? Love this recipe! This was also my first time making any type of egg salad. The only thing I can say, and this was my fault, was that I’m going to have left over egg salad for like a week cuz I didn’t pay attention to how much the original recipe yielded, so I doubled the recipe! If the nutrition content was included that would be great. I’m counting calories on myfitnesspal…found one there but no clue if correct. Love this! I’ve added a touch of curry to it and it is a whole other taste. It is just delicious and very healthy eating. This sounds delicious!! I’m the only one who would eat this. Will it last in the fridge with the avocado? I have just learned to use avocados in things other than quac, and was told when it turns brown not to eat it. I probably would cut this recipe in half but that would still be more than just I would eat. Does the lemon juice keep the avocado from becoming brown?